Shoot development is controlled by the actions of the shoot apical and axillary meristems resulting in the development of lateral branches and leaves. The barley (Hordeum vulgare L.) uniculm2 (cul2) mutation blocks axillary meristem development, and mutant plants lack lateral branches, tillers, that normally develop from the crown. A genetic screen for cul2 suppressors recovered two recessive alleles of ELIGULUM-A (ELI-A) that partially rescued the cul2 tillering phenotype. 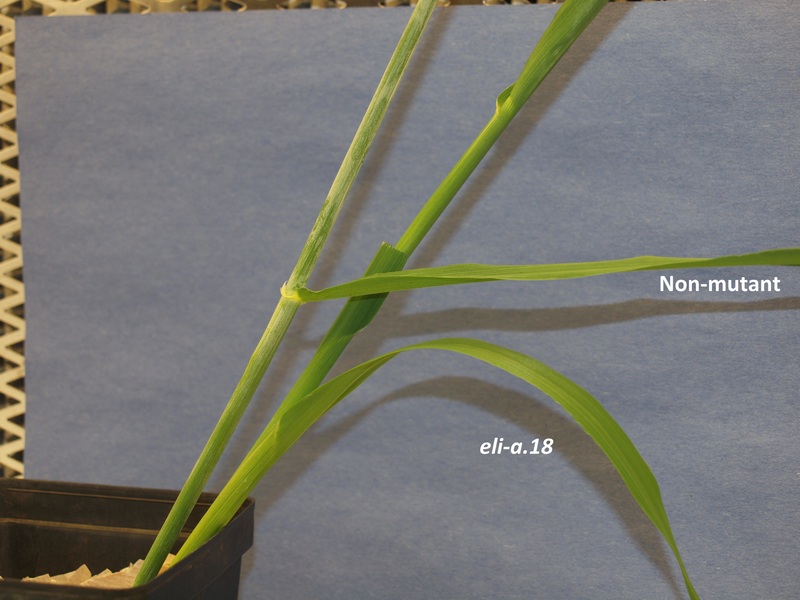 Mutations in ELI-A produce shorter plants with fewer tillers, disrupt the leaf blade – sheath boundary resulting in a liguleless leaf, and secondary cell wall formation is reduced. ELI-A encodes a previously un-annotated plant gene that is conserved in land plants. ELI-A transcript accumulates at the preligule boundary, the developing ligule, leaf margins, cells destined to develop secondary cell walls, and cells surrounding leaf vascular bundles. Recent studies have identified commonalities in the genetic control of boundaries during leaf and lateral organ development. Interestingly, we observed ELI-A transcript at the preligule boundary, indicating a role in establishing the boundary between the blade and sheath. However, we did not observe ELI-A transcript at the axillary meristem boundary in leaf axils, indicating that it does not play a role in establishing the boundary for axillary meristem development. Our results provide a new player in the model for leaf and lateral branch development in which ELI-A acts as a boundary gene for ligule development but not during lateral branch development. Okagaki, Ron J; Muehlbauer, Gary J. (2018). ELIGULUM-A regulates lateral branch and leaf development. Original figure files. Retrieved from the Data Repository for the University of Minnesota, https://doi.org/10.13020/D61H4D. Okagaki, R., Haaning, A., Bilgic, H., Heinen, S., Druka, A., & Bayer, M. et al. (2018). ELIGULUM-ARegulates Lateral Branch and Leaf Development in Barley. Plant Physiology, 176(4), 2750-2760. (dataset) Okagaki, Ron J; Muehlbauer, Gary J. (2018). ELIGULUM-A regulates lateral branch and leaf development. Original figure files. Retrieved from the Data Repository for the University of Minnesota, https://doi.org/10.13020/D61H4D.